Why Should You Change Your Motorcycle’s Gearing? Generally speaking, the first thing people look for when modifying their motorcycle is more power. It’s been so ingrained in our psyche to change the exhaust, let the bike breathe easier, and adjust the machine’s fueling (whether mechanically with a carburetor or digitally via electronic fuel injection) to gain a couple ponies. Next probably comes suspension, because power is nothing without control. However, a topic not usually considered until much farther down the modification list is your motorcycle’s gearing. A discussion about gearing can get rather complex very quickly, so for the purposes of this story we’re going to stick to final drive gearing – that is, the relation between front and rear sprockets – and how different sprockets achieve different goals. Some of this information will apply to belt-driven motorcycles, but unfortunately for you shaft-drive folks now is probably a good time to click elsewhere on MO. While we’re focusing on street motorcycles, the principles of gearing also apply to dirtbikes. An additional X-factor when considering dirtbike gearing is terrain, as riding in the dirt is always a struggle for grip. 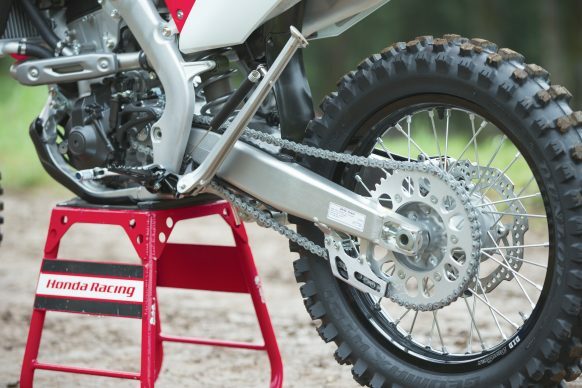 Before we begin, if you’re interested in the relatively simple task of changing your chain and sprockets, our 10 Steps To A New Chain And Sprockets story is a handy guide to follow. This is where the discussion about sprockets gets fun. Different people have different wants and needs for their motorcycle. A racer, or even a street rider, might want better acceleration. The racer’s excuse is to help them get a jump on the competition, while the street rider could use the extra boost simply to get out of the way of traffic easier. On the flip side, a touring rider might want their engine to spin at a lower cruising speed to help improve fuel mileage. In short, the answer is gearing. For better acceleration, gear down (increase final drive ratio). To increase top speed, or in our example scenario, to reduce cruising rpm, gear up (decrease final drive ratio). In plain english, put a sprocket with more teeth than stock on the rear for better drive, or reduce the rear tooth count for lower engine speed for a given road speed. The amount doesn’t need to be huge, either; two extra teeth in the rear over stock can make a big difference. 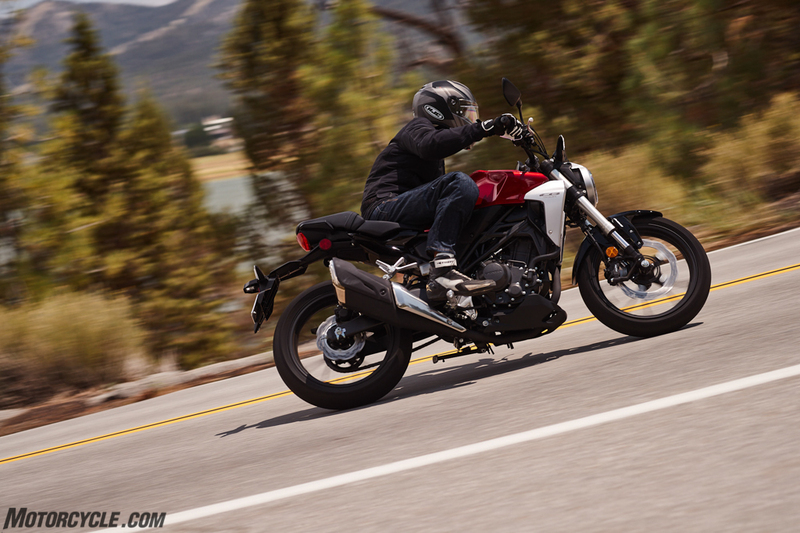 For small-displacement motorcycles like the Honda CB300R, adding a couple teeth to the rear sprocket could result in a dramatic improvement in acceleration. Conversely, better acceleration can also be achieved with a front countershaft sprocket with fewer teeth than stock (one tooth difference is big). However, we prefer adding teeth to the rear as installing a smaller front sprocket makes the bend the chain has to make as it rotates around the countershaft sprocket tighter, causing unnecessary wear. As you can probably guess, adding a larger countershaft sprocket (compared to stock) will also do the trick of decreasing final drive ratio. The thing with gearing is that you can’t have it all. Modern production vehicles, motorcycles included, are all about compromises. So if you want better acceleration, then add that bigger rear sprocket. Just keep in mind it’ll cost you top end speed, and your engine will be spinning faster at the same road speed. So, you might notice more vibration and will probably get worse fuel mileage. If you ride a small-displacement bike, this might be a good option, as top speed is far less important than being able to jump ahead of traffic. There’s another thing to consider when adding teeth to the rear sprocket: that increase in acceleration also makes it easier to loft the front wheel in the air. 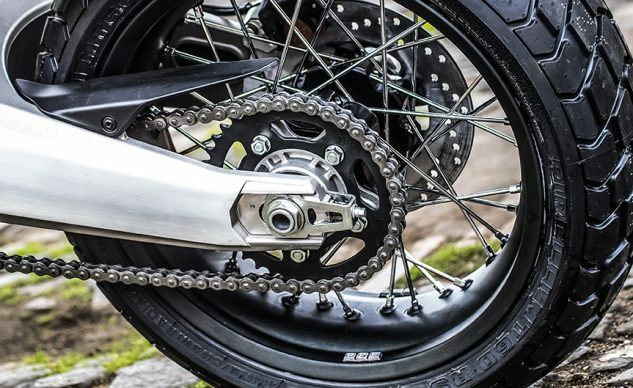 On the other hand, decreasing final drive ratio by adding a smaller rear sprocket will net you a higher top speed and reduce engine speed as you’re cruising down the highway, but your motorcycle won’t accelerate to that speed with the same gusto as it did before. If your motorcycle makes a lot of torque, then the consequence of a smaller rear sprocket may hardly be noticeable. It’s a tradeoff; one only you can decide is right for your situation. For the most part, adjusting your gearing in either direction can make a significant change to the motorcycle, however the one thing to keep in mind is that gearing changes could also affect your speedometer and odometer, depending on how your motorcycle reads speed and mileage. In rare cases, a sprocket change could actually put your speedo and odo back on track, if the stock stuff doesn’t read true for some reason. Either way, the aftermarket is full of solutions to get your clocks to read correctly, if needed. The chain has a fairly tight path to follow once it spins around the countershaft sprocket. Try not to make it any tighter by reducing front sprocket size. Instead, add teeth to the rear. Lastly, when changing your sprockets, it’s always a good idea to replace the chain at the same time. As these are wear items, you want the chain and sprockets to wear evenly and together. Replacing one without the other is cause for premature wear at best, catastrophe at worst. Also, keep in mind that gearing changes could necessitate a different chain length than you had before. One final thing to keep in mind, since you’re now searching for chains anyway, is the pitch of your chain/sprocket combo. Going to a smaller pitch, meaning narrower chain/sprocket, is lighter and thus reduces your unsprung weight. 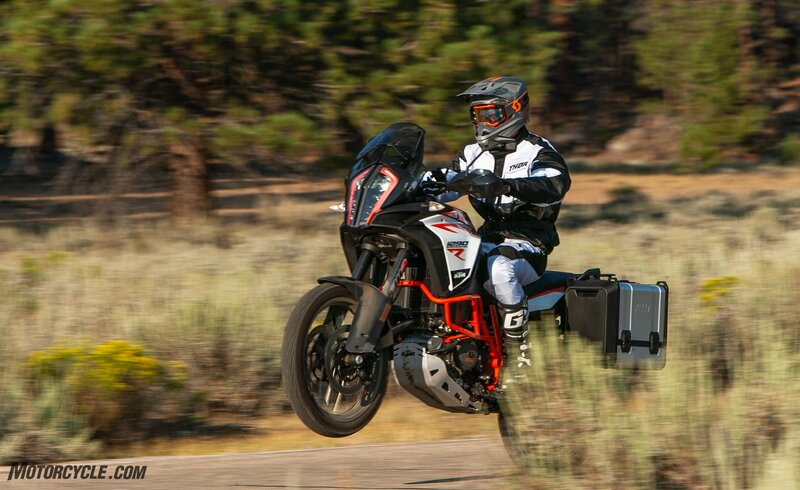 For performance-oriented riders, this is a tangible difference you can feel. 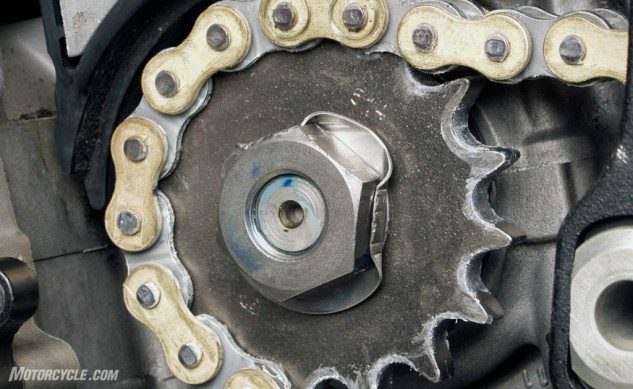 Generally speaking, the tradeoff here is a shorter lifespan of the chain/sprocket combo, but some companies make hardened steel sprockets with considerable lifespans that debunk this rule. Ultimately, it’s up to you to decide what, if any, gearing changes you want or need for your motorcycle. While this guide is by no means complete, it should at least get you started thinking about pros, cons, and concerns. 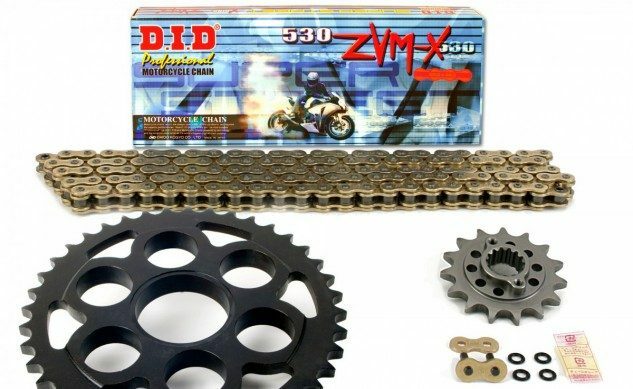 And should you be in the market for a new set of chain and sprockets, some of the companies we like to use are Vortex, D.I.D., Regina, Renthal, RK Racing, Supersprox, and Pro Taper, just to name a few.